Well, now Steve has revealed the true user interface of Leopard will be, and it comes quite close to our speculation half-a-year ago. However, Apple did not rename OS X’s interface to Illuminous, as rumored. Supposedly, Aqua remains as the OS X interface, but now its evolved into a shiny, iTunes 7-like, animated, glassy user interface that we predicted for Illuminous. 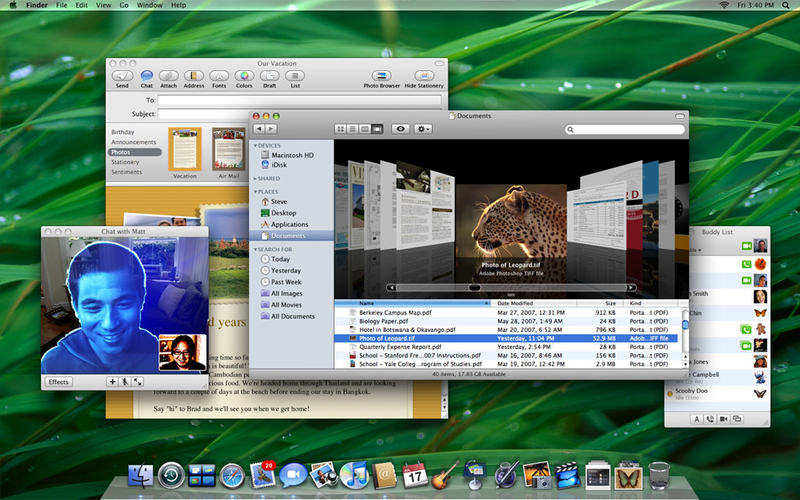 The core of the new interface seems to be centered around the Desktop and Finder, both have been revamped in Leopard. The menu bar is transparent and the dock now has a 3D “block” look. The Finder now behaves much like iTunes 7, with a sidebar and CoverFlow navigation. The only thing I miss are the old folder icons…. the new ones are weird. Hardly a radical change. A Hue/Saturation adjustment, a few (very overdue) icon changes, and a slight revamp of the dock.